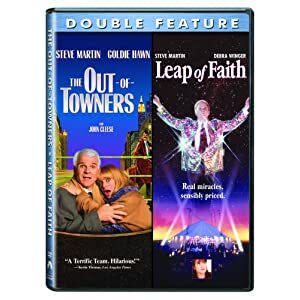 To purchase the DVD of the original LEAP OF FAITH film, click on the image above. Previews for the world premiere run of the Alan Menken-Glenn Slater-Janus Cercone musical, Leap of Faith, start tonight. With opening officially set for the 3rd of October, the show is playing at the Center Theatre Group’s Ahmanson Theatre in Los Angeles. Telling the tale of a part-time reverend and full-time con artist, Jonas Nightengale (played by Raúl Esparza), whose traveling ministry breaks down in a small Kansas town, the show deals with what happens when Nightengale, along with his sister-sidekick (played by Kendra Kassebaum), quickly pitches a tent and invites the locals to a revival to line his pocket with what he needs. The local sheriff, Will Braverman (played by Jarrod Emick) is determined to stop Jonas from separating the townspeople from their money, but Jonas’ real challenge arises when he meets a pretty waitress (played by Brooke Shields) and her son (played by Nicholas Barasch), whose love forces an ultimate cynic to take a real leap of faith. Other principal roles are taken by Kecia Lewis-Evans and Leslie Odom, Jr. The ensemble comprises Brad Anderson, Bradley Benjamin, Tom Berklund, Christopher Bones, Krystal Joy Brown, Ta’Rea Campbell, Eric L. Christian, Michelle Duffy, Harvey Evans, Ashley Blair Fitzgerald, Jennie Ford, Bob Gaynor, Angela Grovey, Shannon Lewis, Michael X. Martin, Maurice Murphy, Anise E. Ritchie, Darcie Roberts, Bryce Ryness, Ariel Shepley, C.E. Smith, Alex Michael Stoll, Dennis Stowe, Katherine Tokarz, Brandon Wardell, Karl Warden, Natalie Willes and Charlie Williams. This entry was posted in Alan Menken, Glenn Slater, Janus Cercone and tagged Alan Menken, Alex Michael Stoll, Angela Grovey, Anise E. Ritchie, Ariel Shepley, Ashley Blair Fitzgerald, Bob Gaynor, Brad Anderson, Bradley Benjamin, Brandon Wardell, Brooke Shields, Bryce Ryness, C.E. Smith, Charlie Williams, Christopher Bones, Darcie Roberts, Dennis Stowe, Eric L. Christian, Glenn Slater, Harvey Evans, Janus Cercone, Jarrod Emick, Jennie Ford, Karl Warden, Katherine Tokarz, Kecia Lewis-Evans, Kendra Kassebaum, Krystal Joy Brown, Leap of Faith, Leslie Odom Jr, Maurice Murphy, Michael X. Martin, Michelle Duffy, Natalie Willes, Nicholas Barasch, Paramount Pictures, Raúl Esparza, Rob Ashford, Shannon Lewis, Ta'Rea Campbell, Tom Berklund. Bookmark the permalink.